All old coin values listed and most will surprise you. From the common to the rare, coins have steadily climbed higher in value. Pennies worth many hundreds, the 1909-S VDB penny is a $365 coin. a 1914-D is valued above $52 and the 1922 penny checks in at $275. All early Indian pennies have a value of $10 to $11 and most are higher. The older coins are even more valuable. 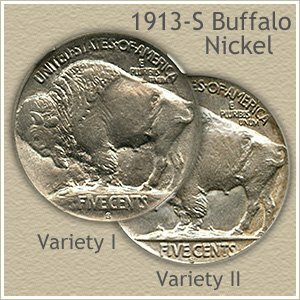 Buffalo nickels dated before 1920 are worth at least $6 and often $30 each. Then there is all the old silver coinage, silver dimes, quarters and half dollars minted before 1965... minimum values are $1.13 for old silver dimes, $2.82 per silver quarter and $5.63 for each silver half dollar. No rare dates to achieve these values, just common old silver coins. Here are a few more valuable coins... Looking at just quarters and going back a few years. From 1890 to 1964, 45 different quarter dates and mints are valued over $25. And every quarter minted before 1890 in "Good" condition is $20 or higher. That is a lot of rare coins. Additionally, pull a half dozen old silver dollars from your box and the combined value easily tops $120. And Gold Coins... All are rare and valuable, none are worth less than $212 , with the majority quickly rising into the hundreds of dollars. One gold coin can quickly double how much your box of old coins is worth. Your old coins are in demand, collector demand, dealer demand. Coins and collecting them is very popular today. Many new collectors are starting and assembling collections. Interest and excitement generated by the Statehood Quarter Series, the new Jefferson nickels, and modern commemoratives bring new collectors into the hobby. Soon the older coins are quickly discovered and the race to collect them is on. Here are four reasons to take a close look and discover your old coin values. Rare Dates: Faced with strong demand, rare dates have nowhere to go but up in value. 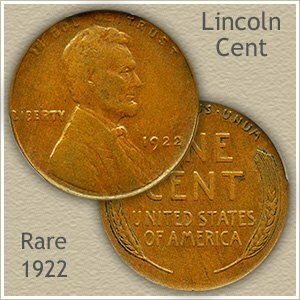 Pictured is a Lincoln Penny with the rare 1922 date. Although the coin is circulated and somewhat worn the value is still in the hundreds of dollars. Every series has its share of rare dates, all avidly sought by collectors. Condition: The desire for the best puts tremendous pressure on the higher condition coins. Well preserved high condition coins are always in demand and the very high values reflect this demand. 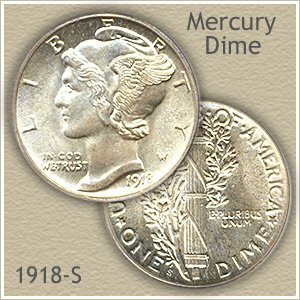 Although a circulated common date Mercury dime is worth $1.25 to $1.78 , this 1918-S Mercury Dime pictured is valued over $122 because of its "Choice Uncirculated" condition. Mint Marks: As collections are assembled the different mintmarks representing mints striking coins are needed to complete the sets. A popular example is the "S" mintmark indicating the San Francisco mint. Another is the rare "CC" mintmark used by the Carson City mint in Nevada, they always cause excitement. 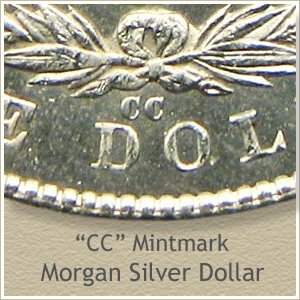 The "CC" mintmark pictured is located on the reverse of a Morgan dollar. Rare Varieties: Certainly, interest and knowledge develops sophisticated collectors. As collections are nearing completion, rare varieties are avidity sought, adding to and enhancing their holdings. The 1913-S Buffalo Nickel is a good example, featuring two distinctly different reverse designs, the variety I "Raised Ground" is a $31 coin in good condition and variety II "Recessed Ground" is a $166 coin. It is often true, the most unlikely looking coin, is the most valuable. Whether it is a rare date, mintmark, popular variety or a "condition rarity". 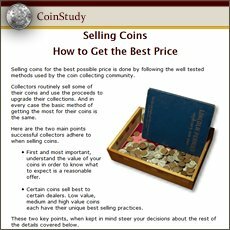 How much are your old coins worth? All coin series are covered in detail, with links to each just below. All dates, mintmarks and were to find them, valuable varieties and how to identify them are covered. Additionally, each series has "Grading" images to judge the condition of your coins, accurately determining your old coin values from the charts. Video index of how to grade coins. Series of coins from Indian and Lincoln cents through the different nickel series, dimes, quarters, half and silver dollars. Each series is studied using grading videos, images and descriptions to judge the condition and assign a grade. Guest Contributor Michael Bernzweig shares his expertise in metal detecting. Make it a fun outing with family and friends and increase your chances of finding old coins and artifacts using a metal detector. Stay current with your old coin values. Return to the main index page Coin Values Discovery from old coin values. Easily sort and value your holdings. An important step in preparing for selling and finding coin buyers.